The election for the next MAYS Coordinator is upon us! Please use the form below to read the statements of interest from the candidates who have applied. Then please submit your vote for who you would like to be the next MAYS coordinator (a two-year term) and the person who will take the lead in planning the next MAYS Meeting. The election will close on July 22nd. Call for new MAYS coordinator! We would like to notify you about the extended deadline to apply for a new MAYS Coordinator! We are looking for one new coordinator who will take Mari’s place from August-September on and together with Lilian keep MAYS as lively and active as usual. We currently have more than 500 members from all over the world and we keep on growing! Through MAYS, young scholars in medical anthropology have the opportunity to exchange their ideas and discuss their work in the pleasant peer-atmosphere of our annual meetings. The MAYS coordinators simultaneously function as student representatives on the board of the Medical Anthropology Network within EASA however, the main work of MAYS coordination consists in the management of the MAYS google group, updating the website, and, which certainly is the most fun, organising the annual conference. Of course, there are all kinds of other things one could think of, but that’s all up to the new coordinators. The deadline for sending in your application is July 15th! You get to turn your ideas regarding medical anthropology into concrete events that inspire many other students. You learn a lot about event organisation and networking. You get to know lots of amazing people and significantly enlarge your professional network. You have experienced MAYS-veterans (Claire Beaudevin, Susann Huschke, Katerina Ferkov, Dominik Mattes, Judith Schuehle; Natashe Lemos Dekker, Mari Lo Bosco) by your side and you get to profit from the great work that Lilian, your co-coordinator, does! It’s great for your CV – not just in academia. If you want to get more actively engaged in MAYS, please write a short e-mail to mays.easa@gmail.com. Please attach a short CV with a few lines on your current professional situation with regard to your academic career/status and institutional affiliation and your ideas for MAYS. This application will then be circulated among all MAYS members and will be the basis for members to vote. Please send your application in by July 15th! The online elections will take place from July 16th until July 22th. Please do not hesitate to write if you have any further specific questions! We’ll be happy to tell you more about the fun that being a MAYS Coordinator entails! 2017 MAYS Annual Meeting – Call for Abstract is now online! 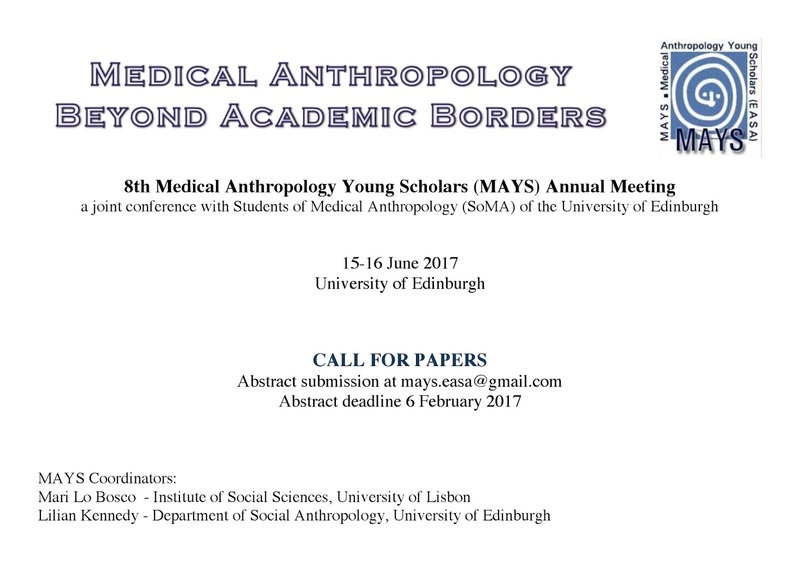 We are happy to announce that the 8th MAYS Annual Meeting will take place on 15th and 16th of June 2017 at the University of Edinburgh in collaboration with Students of Medical Anthropology (SoMA) of the University of Edinburgh. We invite you to send your abstract (max 300 words) to mays.easa@gmail.com by 6 February 2017. Infos about workshops and the keynote lecture will follow later.Please download the full Call for Paper here. We are looking forward to getting to know your work and welcoming you in Edinburgh! We, Mari and Natashe, are very pleased to welcome Lilian Kennedy from the University of Edinburgh as the new MAYS coordinator. She will take the place of Natashe, who stepped down as MAYS coordinator after two years of great work at MAYS, and she will be on board as MAYS representative together with me, Mari. I (Mari) want to warmly thank Natashe for her great work and welcome Lilian to this new and fun adventure! The online election starts today, August 1st, 2016 and ends on the 9th of August, 2016 at midnight. We will announce the new coordinator via email on the 12th of August 2016. To this purpose, we invite you to take a look at the short introductory notes of each candidate (see below) and cast your vote for ONE coordinator via e-mail. In order to vote, please send an e-mail with the subject “MAYS election” in which you indicate the name of your preferred candidate to mays.easa@gmail.com by the 9th of August 2016 – All votes will be treated confidentially. The EASA Medical Anthropology Network board confirmed that those MAYS members who will cast their vote for the new MAYS coordinators do NOT have to be EASA members! This simply means that all MAYS members have the right to vote. So please take the chance, vote, and contribute to keeping our network running! My name is Lilian Kennedy, and I am currently a PhD candidate at the University of Edinburgh, Scotland. I am also a member of the Students of Medical Anthropology (SoMA) group within the Edinburgh Centre for Medical Anthropology (EdCMA). I am very interested in becoming a coordinator for MAYS – both to help keep the internal running of the group’s logistics going smoothly, and create a sense of community and active discussion between MAYS members. Recently, SoMA sucessfully organised a workshop entitled “Who cares: A Symposium on Care in Medical Anthropology” which was especially helpful in creating a platform for us PhD students to be able to present our research and get feedback from the wider academic community (other Phd students, academics from other fields, and Medical Anthropology staff members from EdCMA.) As a coordinator for MAYS I would love to help broadcast these types of student-organised across the MAYS network and encourage collaboration. This would not only help all of us better disseminate the results of our efforts, but also create a way for us to share good strategies, tips, and advice on how to best organise and get funding for such events. Beyond this, it would be also be interesting to open up conversations about MAYS members becoming visiting research student scholars at other institutions with Medical Anthropology programs/MAYS members. Expanding this type of networking would create unique opportunities for cross-institution and real-life MAYS collaboration, and provide a chance for us to experience and learn from a range of Med Anthro communities. In short, as a MAYS coordinator, I would work to expand the range and scope of the many interesting ideas and projects from our community, as well as opportunities for us to network, collaborate, and meet. My name is Mandy Geise, I’m a 2nd-year PhD Student at the Center for Research in Medicine, Science, Health, Mental health, and Society (Cermes3) and the École des Hautes Études en Sciences Sociales (EHESS) in Paris. My research, which is anchored in a larger global health research project, is concerned with the conception, discourses and practices of medical genetics and genomics in Mexico. Having studied in Amsterdam and Buenos Aires before Paris, I enjoy the connecting function of a network like MAYS; it enables us to learn from and about other young scholars from different backgrounds and to share useful information easily. As a MAYS coordinator, I hope to contribute to an increasingly connected network by building on the excellent work done by the previous MAYS coordinators. I would maintain the website and mailing list to stimulate exchanges on research, writing, and events, as well as being a liaison between the EASA and its younger MAYS peers. I look especially forward to organizing a conference as fun and inspiring as this year’s conference in Lisbon. Finally, I aim to give the website an extra spark. As a lover of films, documentaries, and photography, I hope to introduce a new section on the website that makes use of different sorts of visual material: images, reels, stories members bring from their research, but also fragments or pieces that inspire us and make us (re)consider what we come across in our research, or the way we tell ethnographic stories. As a coordinator I hope to help make MAYS grow, to get to know many of you and the projects you’re working on, and to make talking, thinking, and writing about our research (even) more fun!